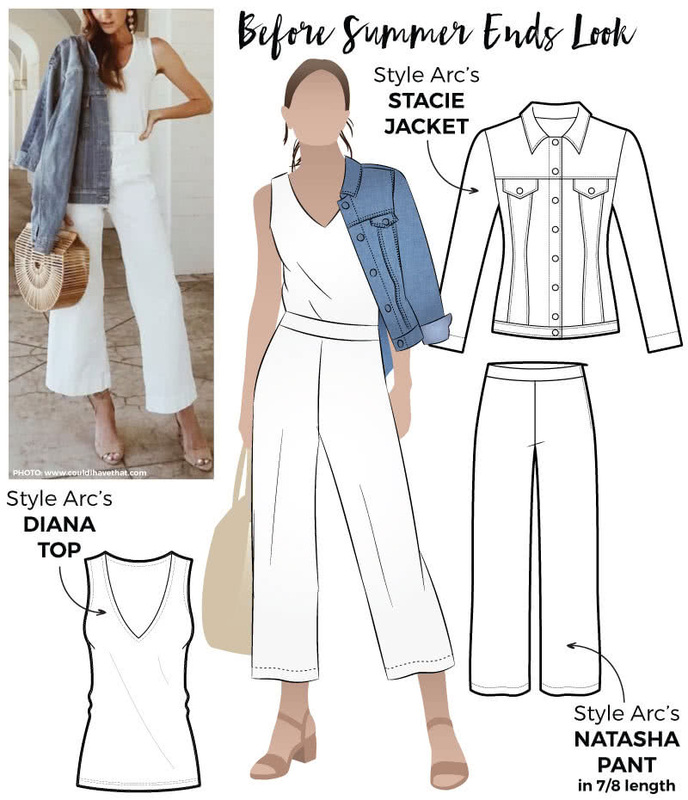 For those of you that are trying to hold onto summer in the southern hemisphere this discounted Get the Look sewing pattern bundle is perfect! Equally if you are heading into summer and the days haven’t heated up yet, be sure to check this bundle out! We have created this new discounted bundle to add to your wardrobe and it is available in the following formats 🌞 Paper Single size, Paper Multi-sized, PDF and Copy Shop single size. When the days are not too hot but it’s not cold either, what does one wear during these tran-seasonal days? We have bundled together three versatile patterns for a discounted look that we feel will fill this void! These patterns are fabulous for tran-seasonal dressing and this is why we called the bundle The Before Summer Ends Look. Our Natasha Pant can be made in several lengths; a full length pant, 7/8 length and a 3/4 length which is great for many seasons. We have grouped the pant together with our light Diana Top that is perfect for warmer nights and if it suddenly gets cold you can throw on your Stacie Denim Jacket. Be sure to check out our YouTube channel here to see how we made this Stacie Jean Jacket!